I’ve long been a fan of gauzy, spooky, hypnotic music, whether it’s Tangerine Dream, Fields of the Nephilim, Cocteau Twins, or Locrian. A couple of years ago, I discovered Northumbria’s gorgeous, improvisational metal by way of fellow music writer Craig Hayes, and quickly fell down the Bandcamp rabbit hole created by Northumbria’s label, thisquietarmy, which ultimately me to Eric Quach’s one-man band of the same name. 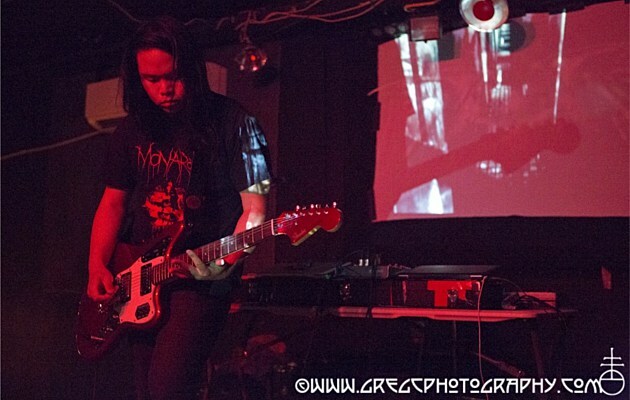 Quach, the 36-year-old former guitarist for post-rock/shoegaze band Destroyalldreamers, released his first thisquietarmy record, Wintersleeper in 2005. Since then, the prolific musician has issued more than 20 albums, EPs, and splits as thisquietarmy. In April, he unveiled Rebirths, a collection of older material for live performances. Although thisquietarmy’s range is quite broad — traversing noise-rock, ambient, drone, krautrock, epic guitar builds, and fervent tremolo picking — it’s held together by Quach’s unwavering loyalty to melody and ability to convey intense feelings through abstract landscapes of sound. Born and raised in Montreal, Quach is a self-taught musician who picked up the guitar at the tail end of his university years, when he was also earning a bachelor’s degree in mechanical engineering. He pursued an engineering career until 2009, when he devoted himself to music full-time. With his red Japanese Fender Jaguar, roughly 15 effects pedals, and three separate looping, including a TC Electronics Ditto X2, he builds soundtracks suited for solitude, catharsis, and apocalypse. The first thing I wanted to ask about was the name thisquietarmy. Where does it come from, and how does it apply to your own music and to the label? I’m not sure, but I think thisquietarmy probably came from a Godspeed You Black Emperor! scribble inside one of their early releases — it went something like, “. . .and these quiet armies will march on. . .” I’ve always liked the symbolism of that image — how it conveys a certain mysteriousness and introverted representation of the music. Also, thisquietarmy sounds like disquietarmy (well, in French anyway), which is an interesting, contrasting dual-meaning. For the label, it was never really intended to be a real label in the first place — and still isn’t, really — just an outlet to release my very first EP, but one thing led to another and I’ve started helping out other friends and like-minded artists to try to form a community. As a musician, what was your path to making music that has a dronelike, experimental quality? Were you always drawn to making music in this vein, was it a progression from your work with Destroyalldreamers, or something else? It was probably in 2000/2001 when I realized that you don’t need to be extroverted to play guitar, after witnessing early post-rock bands playing sitting down in the dark and backtracking to VHS bootlegs of ’90s motionless shoe(pedal)gazing. At that point, I was more interested in these noise-making pedals that actually playing guitar. Thinking about it, it may have been a progression from Destroyalldreamers, as one of the later songs that we came up with, “Her Brother Played The Riot,” was a drone and loop-based track — at least my guitar parts were. It started out as a demo that wasn’t really intended for the band. But then I tried it once with the band and it went on to become the band’s favorite epic 18-minute closer song. Destroyalldreamers was also a rock band most and foremost, and maybe it didn’t go as far as I would have liked, or we didn’t progress to that point as fast as I wanted to, in terms of being more ”out there.” It was a pretty simple band in a way, which was great to learn from. But eventually it became less and less gratifying creatively, and I needed my own vessel to be able to experiment by myself and to explore the more abstract side of ambient soundscapes. As I’ve figured out how to work out the sounds, I started pouring more and more of myself into the music-making and it became my main vehicle and solace. I was first introduced to drone through Sheila Chandra, who helped bring traditional Indian drone styles to a Western pop audience. She talked about how this kind of music is ancient, and yet replicated in the electronic noises around us. She also talked about how drones kind of play tricks on the listener, and how she could you like most about the form? The meditative aspect is definitely one of the most dominating appeals of drone, how it can indeed make you go into trance, and how you just become absorbed into the sounds and how you have to find your own way into this hypnotic state of mind. I think your mind gets so focused that it becomes so free to interpret or imagine anything that you feel, or can even take you outside of yourself for a while. I’m pretty introverted by nature, so it just goes hand in hand with that kind of personality. I don’t suppose the extroverted ADDers are particularly attracted to the zen, but the world might just be a tad quieter if they were. Musically, where do your ideas come from? Are you writing with a particular audience in mind, are you working out something personal through the music, or a combination of both? I usually just let things happen at the moment that I decide to write and record something. It usually starts with improvisation, and then just re-listening over and over to analyze what particularities came out of it and why or how, I suppose, from what I’ve been absorbing and how I’m expressing and releasing it through my instrument and sound tools. Then I go from there and be inspired to relate a specific part to something that could be and then try to build it up. Lately, I haven’t had much occasion to isolate myself completely from the world and purely channel it without any influence whatsoever. I’ve been touring so much the last few years, meeting and hearing tons of different bands, meeting audience members who discuss their interpretation of my music and such — I mean, it does affect my style and the process for sure. It’s pretty impossible to be immune to being exposed to feedback and to new sounds and new inspirations. I also don’t like to repeat myself and I always aim to try to create something new despite my limitations, and I’ve been mostly working alone for 10 years now, so it’s getting harder and harder to find new sparkles. I do appreciate any kind of new influences that seep in. Your songs are so heavily layered and textured. What’s your composition and recording process? You just put out an album, Rebirths, which are re-recordings of older TQA songs that you said have evolved, particularly for live performances. Can you say more about how your songs change with time, particularly in the live context, and why you wanted to give these songs in particular new life? Prior to all that heavy touring, I was recording most of my albums in the studio and they are usually fruits of spontaneous improvisation and weren’t really meant to be performed live, or I had no plans to at the time. A lot of the tracks from Resurgence and Vessels, albums that came out in 2011, are actually from works that have been going since as far back as 2006-2007. It wasn’t really a plan of mine to tour this intensively and this heavily, but somehow today I’m on my seventh European tour, having played almost 200 shows in Europe alone, and a whole bunch in North and South America since 2011, an interest for thisquietarmy gigs that was most likely sparked from these two albums specifically. So when I first had to learn how to play those studio tracks in a live setting by myself, it had to be in a way that was satisfying and gratifying to me, which meant real-time playing all the parts with no back tracks, just pre-recorded drum loops and all sound effects coming from the guitar and physical effect pedals. By doing that, it was like performing interpretations of my own studio tracks, and the more I perform them, the more the tracks took a life of their own and evolved into recognizable live versions, but that became more structured and more aggressive and intense than the album versions. It also became a huge problem to bring my whole discography on tour: too many releases, too many choices, too heavy and not practical when you’re touring alone. Most people who come to the show do not have an extensive knowledge about everything that I’ve released in my career, and if they liked the show and want to buy something, most of them will want to own the closest thing to the songs I performed. So Rebirths was a solution. You post a lot of great photos on Instagram, both when you’re at home and when you’re touring. It made me wonder whether travel or sense of place plays a role in your music. I think you can sort of feel it on my latest album, Hex Mountains, where the artwork is made of photos that I take on tour and that I post on Instagram. Also sometimes on tour, I take some time off to record in different locations or collaborate with people that I meet during my travels. I wouldn’t tour this much if I didn’t get to see anything and if I didn’t get this much experience out of my travels. With the last two tours, most of which I’ve done completely alone, either by renting a car and driving myself at every show to perform or taking the plane/bus/train/ferry to get to different places, I sort of invented the tourism-tour concept where you need to go to the next city and perform the next day but still have some time to take a walk, get a feel of all the different cities, live a few local experiences before taking off. When you travel with a band, where you need to be at the venue at 3 PM to soundcheck, then wait for showtime, then pack up, go to the hotel and sleep at 3 AM for a few hours before going back to the van at 7 AM, it’s just no fun. If I’m alone, I’m better able to regenerate whenever I need, or go sightseeing whenever I want, and not having to compromise or wait after other people. Sure, it may sound lonely and misanthropic but I do meet new people in new cities every day and it’s a blast. Thisquietarmy is also a label, and you put out a number of albums by like-minded bands and projects, including Northumbria’s work and a recent album by Locrian’s Andre Foisy. What made you want to widen the net? I think it’s a way to contribute and to give back to the scene, as to not be so stuck into my own personal self-involved endeavor. Sometimes it’s good to disconnect and work with others who are trying as hard to get their music heard. That’s the case of the likes of Sequences, Adrian Aniol, Northumbria, Elika, Shane Whitbread, Electroluminescent, Ekca Liena, Talvihorros, Le Chat Blanc Orchestra. . . But it’s also a great way to be involved with artists whose work I admire such as André Foisy (Locrian), Yellow6, Aidan Baker (Nadja), Apillow (Below The Sea), The Sales Dept. (Beef Terminal), unFact (The Jesus Lizard), Noveller, lovesliescrushing, which was probably the highlight of the label’s history for me. Also, it’s an easy way to release my stuff and my side-projects Mains de Givre and Parallel Lines. But usually I work with people I’ve already met, so that just makes it all the more enjoyable. How do you choose what bands or albums belong on the label? The label has no commercial ambition whatsoever. In fact, that’s pretty much the first thing that I try to explain to the artists that I want to work with. If I like the music and if it fits the aesthetic of the label, then I’m just looking for a really simple relationship with the artist in which they know exactly what they are getting into without any kind of further expectations than how the final product will be and what the artwork can consist of, since everything is handmade. There is a strict design template to adhere to in the sense that there are some constraint and limitations to what can be done as almost nothing ever gets sent for pressing or to the printers; it’s all done at home. Is there anything on the horizon for you or for the label that you’re particularly excited about? I’ve just got back home in Montreal from this incredible six-week tour; I played 31 gigs in 13 countries including Russia and Scandinavia. But I’ve already started booking for the next tour this fall, as I will be playing the Incubate festival in Tilburg, Netherlands, which is pretty exciting. I’m also hoping to tour in Japan as well. As for the label, a project that has been in the pipeline for a while: “I heart drone,” which is a three-inch thisquietarmy drone CD placed inside a small wooden canvas where I draw an unique artwork on each copy, of 48. Maybe I’ll do a vernissage somewhere when they’ll finally be all done. I’m also trying to figure out some special mail-order editions of the Rebirths LP, since it’s one of the rare TQA Records releases that I’ve sent out for pressing and it’s definitely missing some custom, handmade elements to it.